I picked this up in an antique store in Duluth, MN today. The family was rushing me, so I only had a short amount of time to look it over before purchasing it. The date on the handle is Jan 13, 1920. There's no cracks anywhere, and the only thing damaged was the clasp on the case which is missing. Is this a decent razor to shave with? It seems pretty heavy compared to my Gold Tech I've been using. That is a true beauty...I think a great buy and I,m guessing will be a favorite of yours....honestly a real delight to use,own and even look at....you did great...enjoy !!!! $35 is a hell of a deal on that. 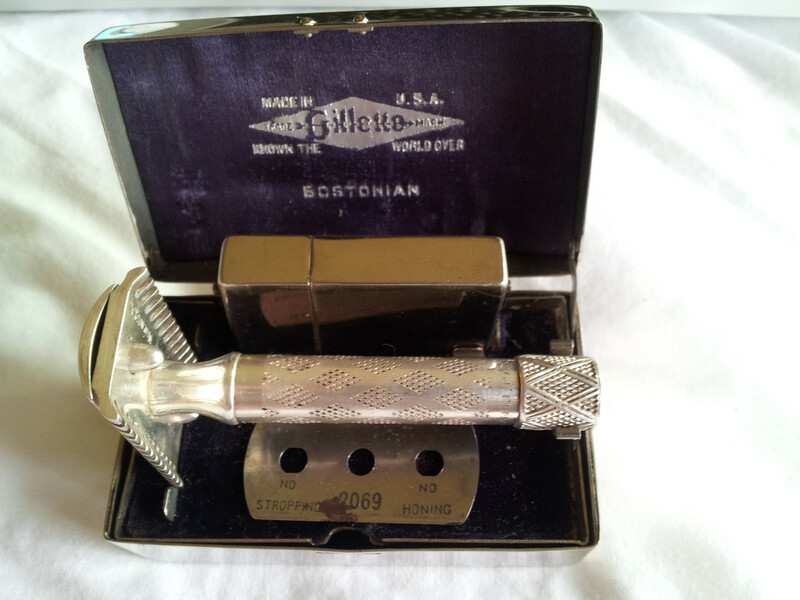 It's a fantastic razor to shave with but it will be a bit more aggressive than the Tech. Enjoy it. Those are a little more common than others but they don't come along very often. Thank-you gentlemen! I'll have to clean it up and give it a try. Keep an eye on the selling and trading thread, because it may end up there if I don't enjoy using it! I think you'll like it enough not to sell it. It looks clean. Those are just neat razors. Great deal on that, I spent more then double for mine from the bay. I still haven't shaved with mine as I like it too much and I doubt it can ever live up to how it shaves in my imagination. That was a fantastic deal and yes, they are really great to shave with. Grant, those are great shavers and you got a fantastic deal. If you don't like it, i know someone who would easily take it off your hands. Hee hee. Enjoy and good luck. Congratulations on a great score! I have a Richwood and enjoy using it frequently. Great price and great shaver. One of my favorite razors of all time, both in appearance and performance.